You could have these just for dessert, but show me where in the rule book it says that sweet crepes can't be a whole dinner. Halve the strawberries from punnet and cut the other punnet's fruit into 2cm pieces. Combine the pieces only with the sugar and Cointreau and mix well. Set aside for 30 minutes. Chill the strawberry halves separately. To make the crepe batter, combine the ingredients in a blender and blend until smooth. Rest in the fridge for at least 30 minutes. Whip the cream with the icing sugar to soft peaks. Heat a frying pan over medium heat and brush with melted butter. Fry the batter into crepes (around ⅓ cup of batter per crêpe) for 2 minutes on one side, and then flip and fry for a further 20 seconds only. 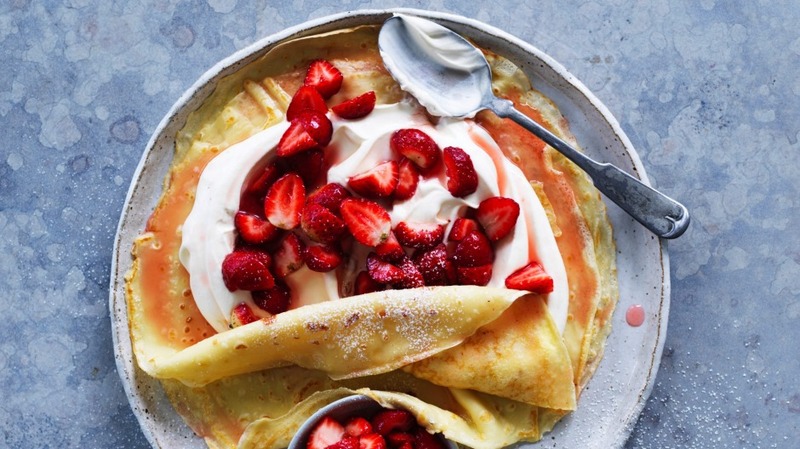 Serve the crêpes with the cream, macerated strawberries, fresh strawberries and a dusting of icing sugar. Adam's tip When making crêpes (or pancakes) always have at least two pans on the go. They take seconds to wash up and will halve your cooking time. If I'm cooking for a crowd I'll put three or four pans on and a whole stack of pancakes can be done in minutes.